As you might imagine by my complete lack of posts last week, it was a busy past six days. I'm still in the throes of getting the Spring Fling in the City event together (it's going to be SO much fun, you guys, so make sure you RSVP! ), and then my in-laws came to visit over the weekend, which is always a good time. We ate some delicious food at Pastaria (clearly, our new favorite), went to the Art Museum and Friday night we saw Ricky Skaggs and Kentucky Thunder at the Sheldon. I haven't listened to bluegrass very much in the past, but I think I'm 100% converted into making it a regular genre on my iPod (and, more importantly, in our vinyl collection). The performance was absolutely amazing, and I highly encourage you to check out his work. We unfortunately were shorted one night of hanging out with the hubs's parents due to the snow storm on Thursday, and I guess that was in the back of my mind when I decided to bake some cookies that night. We just got these beautiful organic lemons from our Green Bean Delivery produce box, and I am such a sucker for lemony desserts, so I hit the thrifted cookbooks in search of the perfect recipe. 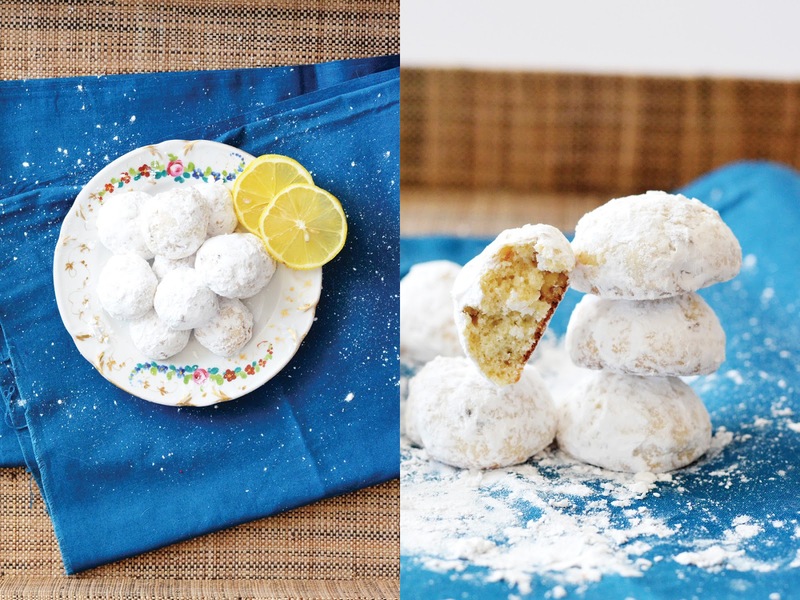 I landed on a variation of Betty Crocker's English tea cakes called lemon snowdrops. 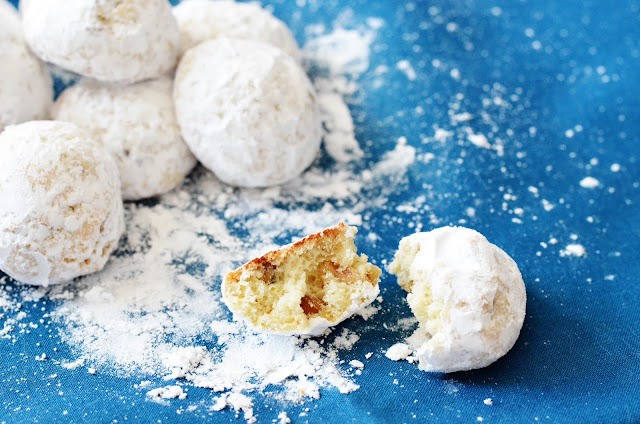 Little balls of dough infused with lemon juice and zest, chopped nuts, and then rolled in powdered sugar once they've cooled from their time in the oven. The outside is a little crunchy, which I liked, and the inside has a softer shortbread texture. Overall, a nice bright bite during the chilly winter months! One trick I've learned about coating things in powdered sugar: Once the cookies are cooled, take a third of them and put them in a paper bag; add about 1/2 cup of powdered sugar; then twist the bag shut and kind of roll it around in your hands (instead of shaking the bag) for about 6 or 7 turns. This keeps all the mess in the bag and the cookies get an even layer of the sugar, too. Just add more sugar, as needed, as you finished coating the other 2/3 of the batch. In a stand mixer fitted with the paddle attachment, mix shortening (or butter), sugar, egg, lemon juice and water together thoroughly. In another bowl, sift together flour, baking powder and salt. Stir in to wet ingredients and mix thoroughly. With a spatula or wooden spoon, mix in lemon rind and chopped nuts. Roll dough into balls (mine were about the size of a large gum ball) and place on baking sheets (I put about 15 per sheet, and then had to bake two lonely extras by themselves after the other two batches were finished). Bake for 12 minutes or until edges/tops start to brown. Cool on racks and then coat in powdered sugar. Love lemon already, but these look absolutely delicious!